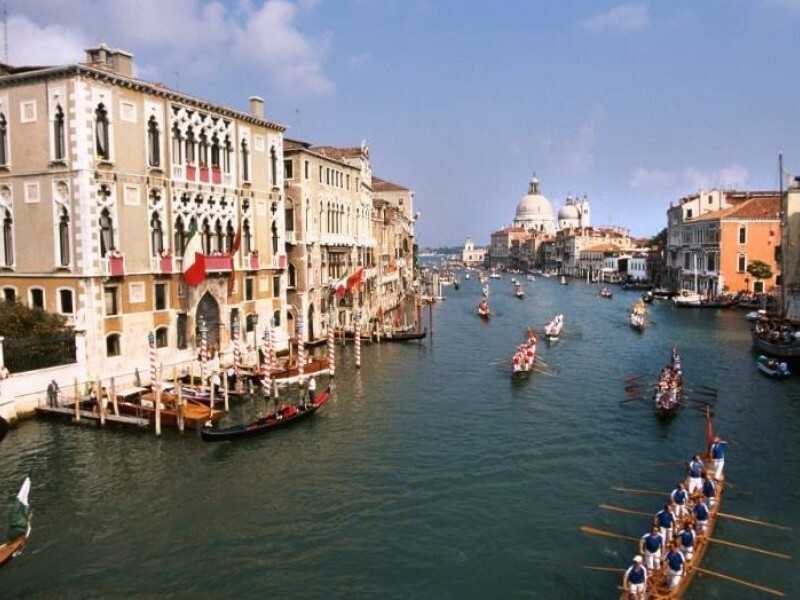 Somewhere, far beyond the horizon, Venice and the sea are waiting for you! But there will be many temptations on your way there. Stunning countryside and attractive towns invite you to linger on your journey: the vineyards of South Tyrol, Verona, Vicenza and Padua, Lake Garda. Relax in the thermal spas in Abano or in traditional Italian taverns. And then eventually, you will see the sea. Venice. The town built on poles. Lord Byron once wrote, “I saw from out the wave of her structure’s rise, as from the stroke of the enchanter’s wand: A thousand years their cloudy wings expand around me”. Venice will also bewitch you. And yet the journey will be your goal! 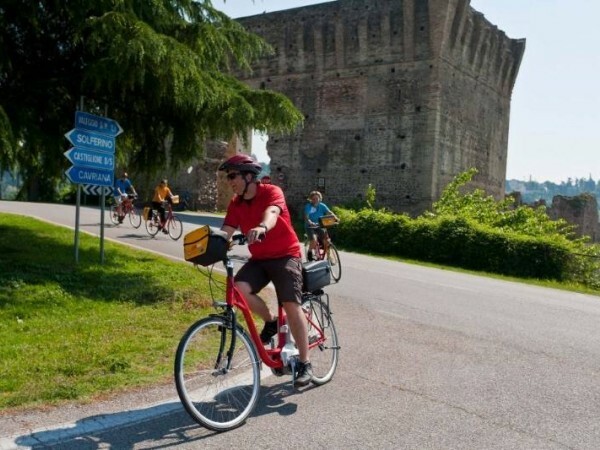 First, you will continue to cycle along the Adige, to Rovereto from here the tour leads westwards towards Lake Garda. In Mori you will taste the world famous pistachio ice-cream in the Gelateria Bologna. After a short ascent, you will descend down to the lake to Torbole and on to Riva. From here, a boat trip will take you down the entire length of the lake to Sirmione or Desenzano. Partly flat and partly hilly, the route will take you through the vineyards on to Verona, a town full of sights (the Festival Arena, Juliet’s house, the old town walls). Day 5: Verona - Vicenza approx. 70 km Today’s route is initially flat and then you will cycle through the Monti Berici hills to the excursion area of Vicenza, with a beautiful view over the city. To make this longer stage a bit shorter, you can also travel the first part by train to San Bonifacio. In the old town of Vicenza, you can feel the spirit of Palladio, the famous architect from the Middle Ages. On leaving Vicenza, you will see numerous Venetian villas, such as the Villa Rotonda. The route along the river Bacchiglione leads to Abano Terme, one of the famous Italian spa towns. From Abano Terme, you can easily travel by bus to Padua, the city of St Anthony and the scholars. There you will have enough time to enjoy the thermal baths. If you are culturally-minded, you can enjoy Padua overnight for an additional charge. In category charm, this extra night is included. With a light wind behind you most of the time, it’s an easy ride towards the sea. The landscape is full of meadows and fields. 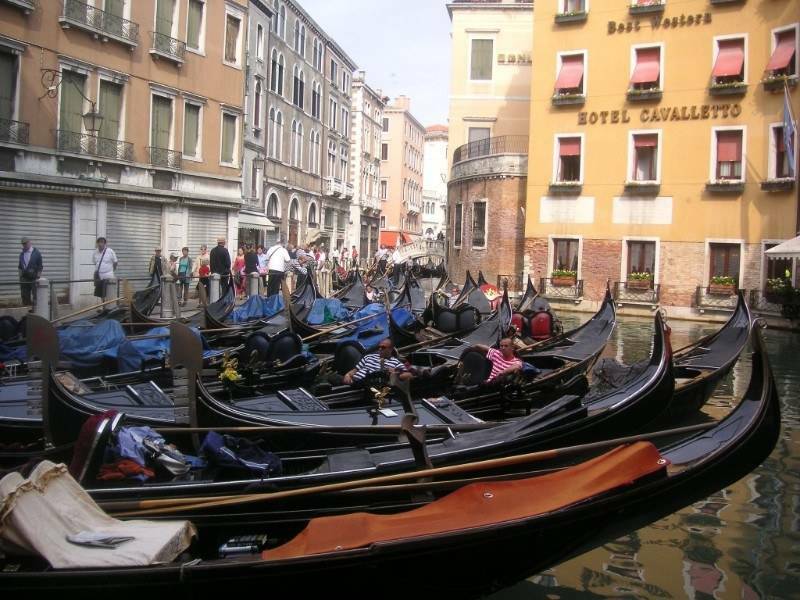 This stage will take you to the mainland before Venice, with its excellent bus service into the city of lagoons. At the end of your tour, not far from Marcus square, you can look forward to a little Grappa tasting session! The terrain is mainly flat and sometimes slightly hilly. 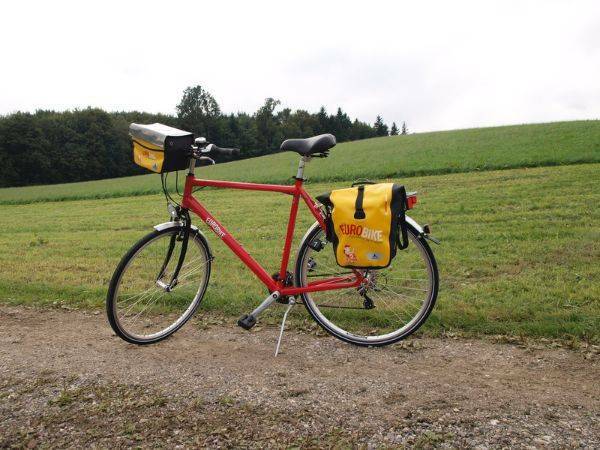 The only strenuous stretch is when you ride through the Monti Berici hills. 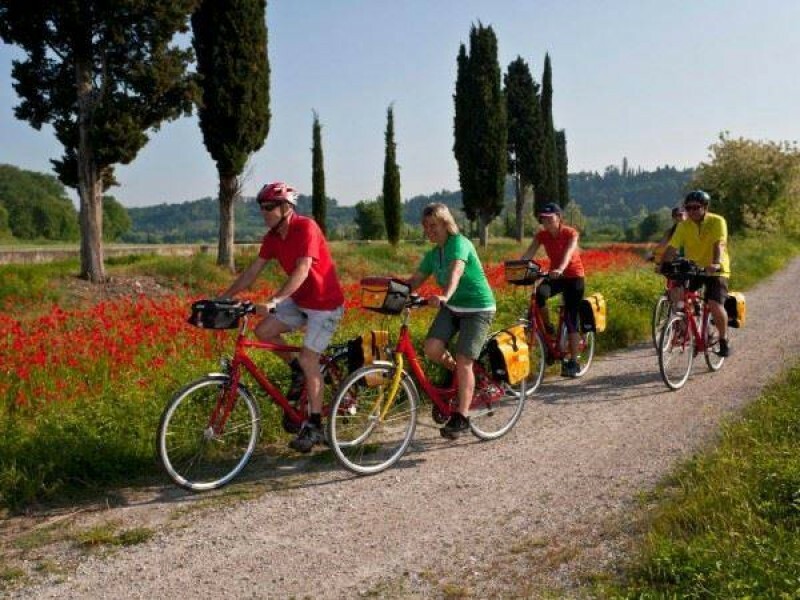 The first two stages are mainly on cycle paths and to the south and east of Lake Garda mostly minor or side roads. 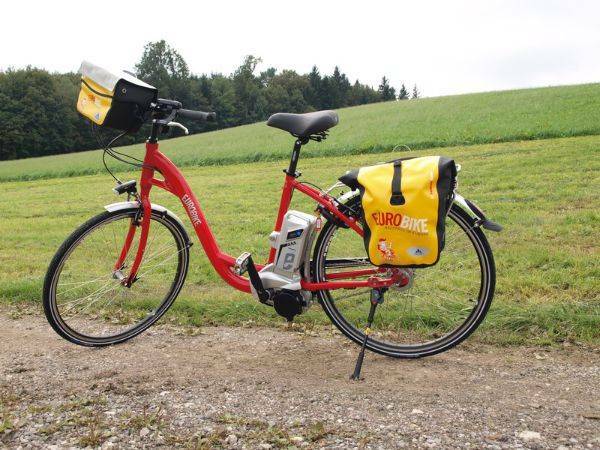 Bolzano – Trento 70 km Almost the entire way to Trento is on cycle paths. The whole stage is flat. 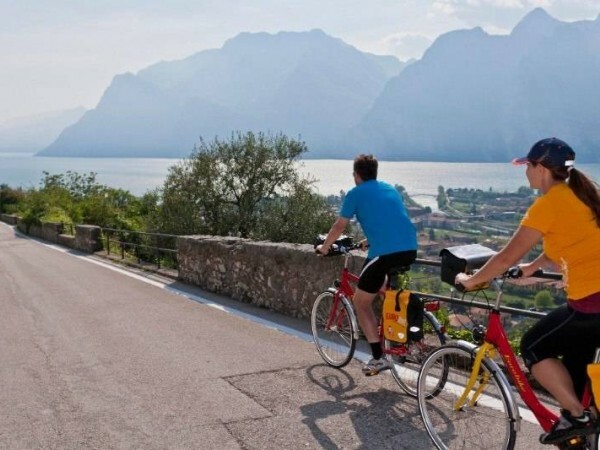 Trento – Lake Garda South 50 km Almost all of today’s route runs along cycle paths until Riva del Garda. There is an ascent of about 100m in altitude in Mori. Afterwards there is a long descent to Lake Garda. 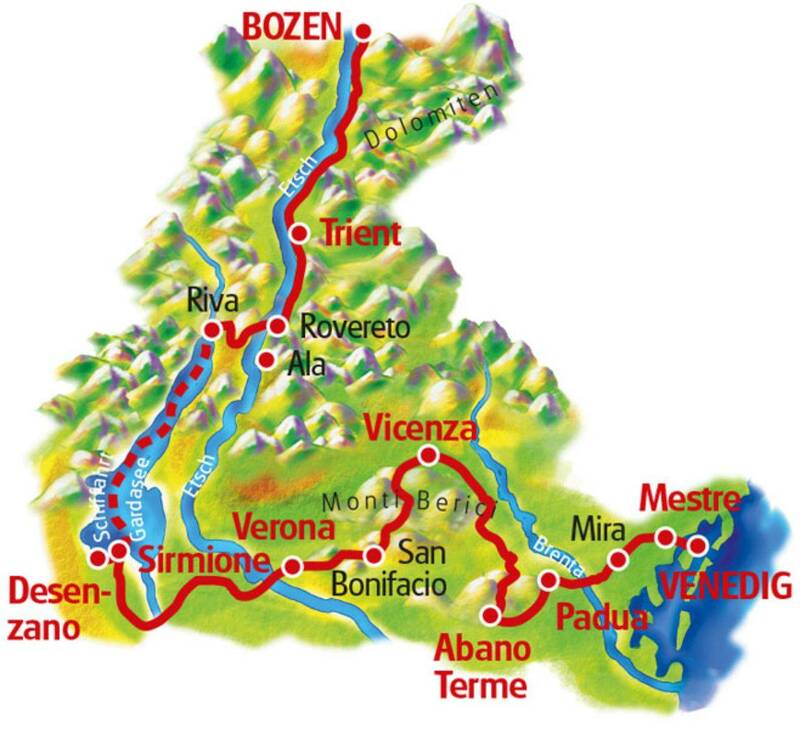 Verona – Vicenza 70 km The overall distance is about 70km and the Berici Hills (4km long climbs and 300m of elevation gain). It is definitely strenuous and you can take a train for the first section to San Bonifacio if you want. The train goes from Verona Porta Nuova at 08:21, 09:21, 10:21; journey time of about 15 minutes; towards Venice (these trains also take bikes). In addition to the route description, you can also follow the official “l1”bike path signs. Vicenza – Abano Terme / Padova 45 / 55 km The stage is only 45km long. This leaves you enough time to go to the Abanos thermal springs or for a cultural trip to Padova. It is mainly a flat route. At the 10.7km point the bike path runs parallel with the road. We recommend our route through the villages instead. Those who want to stay on the bike path should be careful of the exit in Ponte di Castegnero. Guests who booked their overnight stay in Padua, please follow the route description for the next day. Abano Terme / Padova – Venice/Mestre 50 / 40 km Unfortunately there are some sections in Padua with heavy traffic that cannot be avoided. Mainly flat route. 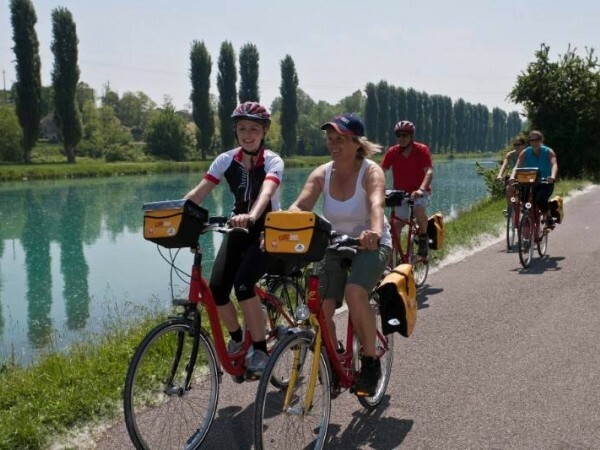 It is possible to drive around Padua: at the 10.2km point, turn right and follow the cycle path along the channel. At the 16.8km point, you will return to the original route description. 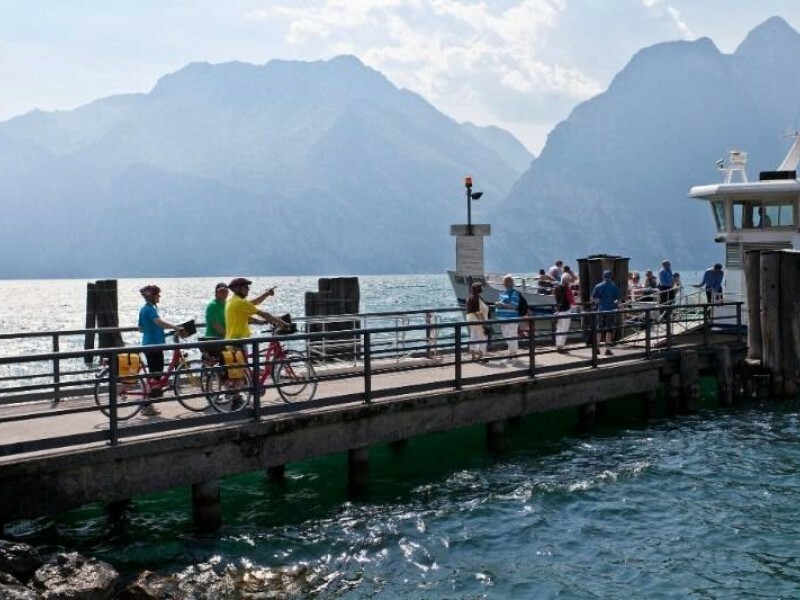 We recommend flying to Innsbruck, Verona or Venice region airports to reach the starting point of this cycling holiday. By Train: Bolzano train station – South Tyrol/Italy Hotel Luna Mondschein: About 400m from the station. From the station you go straight ahead onto the Laurinstraße, continue straight ahead into the pedestrian zone to Weintraubengasse and Bindergasse, where you will find the hotel entrance. Taxi fare is approx. €7 to 10. 4 Hotel Scala Stiegl: About 800m from the station. From the station you go straight ahead to the Laurinstraße, continue straight ahead into the pedestrian zone to Weintraubengasse until the Rathausplatz. At the Rathausplatz turn right through the Torbogen (archway) right into Piavestraße/Brennerstraße and follow the road to the hotel. Taxi fare is approx. €6. Hotel Chrys: From the station you will need to board the citybus line 8, costing €1.50 for a single or 3 Euro for a day ticket. You will need to disembark the bus at “Drusus-straße” (restaurant “La Grolla”) a few metres from the hotel. Hotel Four Points by Sheraton: By bus SASA 10A or B to the stop „Messe“, just in front of the hotel, it costs €1.50 for a single ride or €3 for a day ticket or by taxi it costs approx. €15 per taxi. 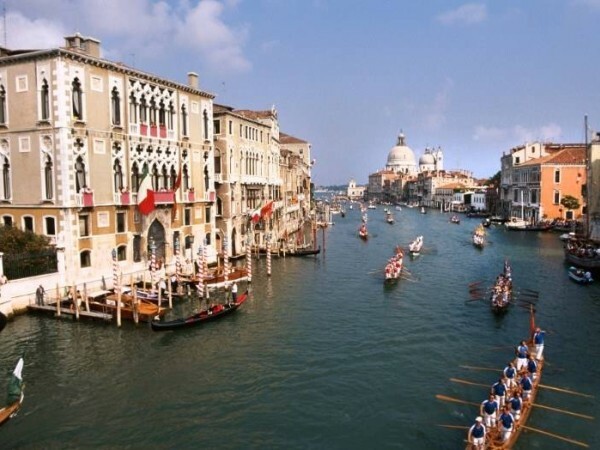 By Plane: Venedig – Marco Polo: Take the ATVO shuttle bus from the airport to Mestre train station (costs approx. €7 per person), then take the train to Bolzano (costs approx. €30 to 40 per person). Treviso – Canova Airport: Take the ATVO shuttle bus from the airport to Mestre train station (cost approx. €10 per person), then continue by train to Bolzano (cost approx. €30 to 40 per person). 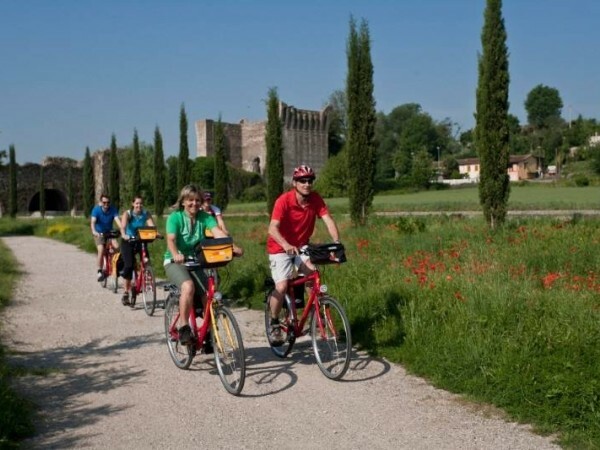 Verona – Catullo: Take the ATV Bus from the airport to Verona Porta Nuova train station (costs approx. €6 per person) and then take the train to Bolzano (costs approx. 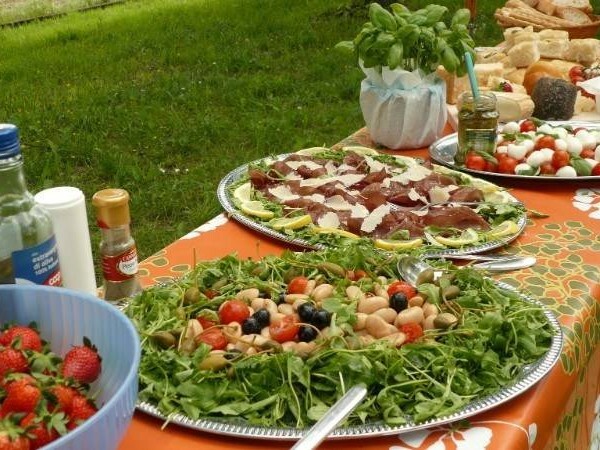 €9 to 20 per person). By Car: Further information on request! Please keep in mind that toll stickers are compulsory on Austrian motorways! A 10-day toll sticker costs €9, a 2-month sticker costs €26,20. An extra toll is levied for cars on the Austrian Brenner motorway, costing 9 Euro. A further toll on the Italian motorway from Brennero to Bolzano costs approx. €5.80. 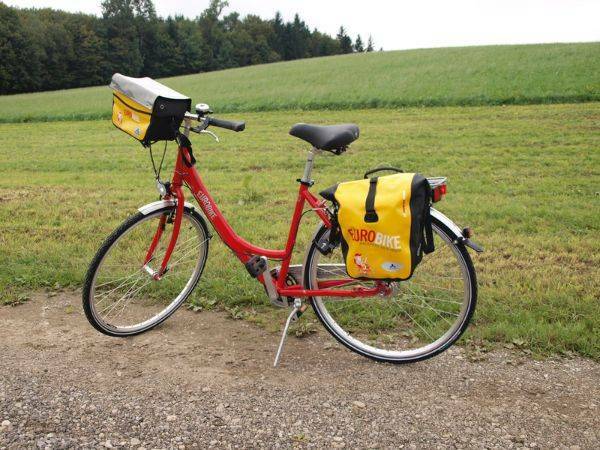 The Bolzano to Venice cycling holiday includes the daily transfer of luggage to the next hotel and local support if required.